The oft-flawless company stumbled in Ping’s launch, and the reasons why are representative of Apple’s relationship with consumers, record labels, and Google. Click around for early opinions of Ping, Apple’s new social network for music, and you’ll start seeing the same complaints: It’s like a crowded room with the lights out; it’s impossible to find your friends, especially without Facebook or Gmail integration; the artist community is non-existent, except for a few Apple partners promoting the service. (Why else would Ping “recommend” we all follow Lady Gaga, Yo-Yo Ma, and Rick Rubin?) Boil it all down, and the early consensus is that the oft-flawless company, with Ping, has stumbled to serve consumers, distanced itself from record labels, and even aided Google. Jobs introduced the service Wednesday as a “social music discovery” engine, but what’s there to discover? Check out the “Music I Like” section of your profile. Notice anything strange? The only items listed are from iTunes purchases. As someone who rarely purchases music through Apple (though it’s my primary music player), this is plainly apparent. Ping suffers from its rigid commitment to iTunes. Of the thousands and thousands of songs in my library, Ping has plucked just seven–the only seven I bought through iTunes, all of which Apple knows are readily available for purchase through its store. Think a little further about that: Are the pioneers, the real tastemakers, who sift through countless weekly offerings from musicians, buying their music from iTunes? They’re probably spinning indie bands not yet featured, or mixtape music that will never find its way into the store. Consider rapper/R&B superstar Drake, whose first mixtape broke on the Web in 2006 before official releases ever hit iTunes. Many artists and bands haven’t hashed out deals with Apple. This absence is a doozy. How can you build a social network around music when so much music is missing? If you had to guess, what would you say is the #1 best selling band of all-time, likely one of the most beloved-bands in music history, and a group that most every iPod-owner would cite as having made at least one of their favorite songs? The answer is obvious: The Beatles. But John, Paul, George, and Ringo won’t be on anyone’s “Music I Like” list. Why? The Beatles are not available through the iTunes store. For those who consider music core to their identities, arguably the very people you want contributing to a social media platform about music, Ping might feel more like an iTunes receipt than a social network. 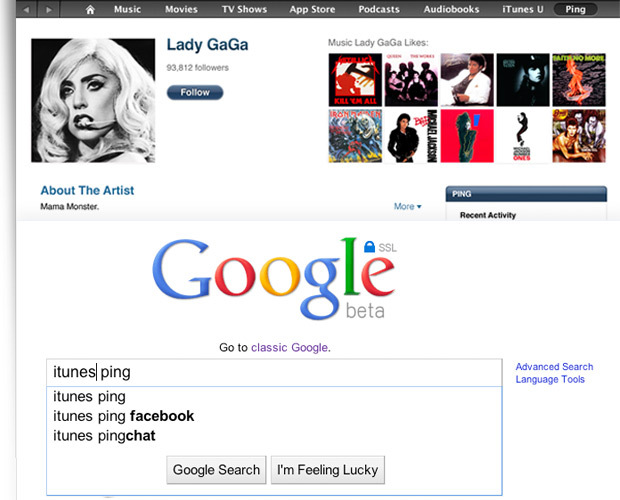 The lack of artists featured on Ping also highlights Apple’s rocky relationship with record labels. According to multiple industry sources, Apple did not include several major labels in the launch. “In Apple-land, it’s all about keeping things completely mum for security reasons,” said one industry source. “They weren’t giving us tons of details,” said another. Only this upcoming week is Apple supposedly briefing the major record labels on Ping, says one source. It’s tough to figure out who’s being more lethargic here: Apple, who launched its social network without asking the big four–EMI, Sony, Universal, Warner Music–to create profiles for their top artists prior to Ping’s launch; or the labels, who can’t yet say what, if any, plan they’ll have for leveraging Ping to promote their artists. (And would they, in the short and decidedly unimaginative term, port over artists’ Facebook profiles as place holders?) Either way, it’s a missed opportunity to debut a vibrant community at launch. Instead, music-lovers of all genres (or at least the three they’re allowed to define on Ping) are stuck friending Jack Johnson or Katy Perry. The labels, it could be argued, have a reason to hesitate. Apple controls more than 80% of all digital music sales (thanks largely to labels’ inability to innovate), and labels would likely be reluctant to hand over any more leverage in the form of marketing via Ping. If Ping becomes even a fifth of Facebook’s size–and with 160 million users registered on iTunes, it very well could–no label could contain it. Which leads us to Google. There have been bubblings of a possible iTunes rival from Mountain View (the ballyhooed “Google Music”) for some time, but according to several sources, Google’s music service may be available by Christmas–and record labels couldn’t have it soon enough. Not to mention music listeners, who may be growing tired of Apple’s my-way-or-the-highway approach.